Some best practices for dealing with medium stacks (25-50 BBs) on your left or right in tournaments. Having a tight player with a medium stack on your left is like having the button twice per orbit. Last week, I shared some of the adjustments I make in multi-table tournaments when I am facing short stacks on my left and right. This week, I will discuss how I contend with the medium stacks around the table. I will define a medium stack as 25 to 50 big blinds. 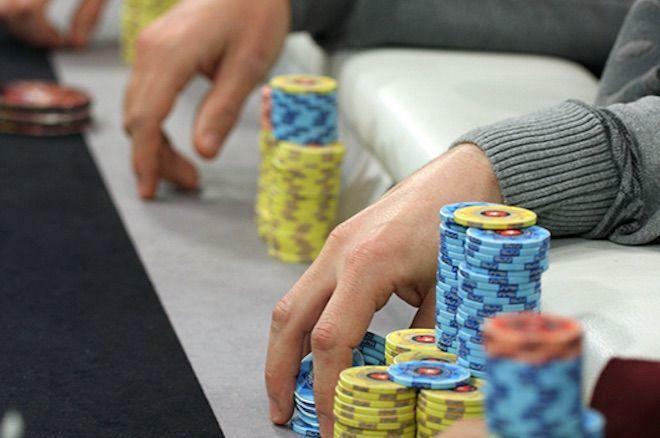 At this size, most players feel like they have too many chips to shove over a normal-sized open. When these stack sizes are on my left (acting after me), my focus switches to how often they three-bet and how they play postflop if they decide just to flat-call instead. Tight players are at their tightest when they have medium stacks. They have too many chips to shove. By definition, they don't flat or three-bet often. The only option left is for them is to fold a ton of hands they would otherwise play. Having a naturally tight player with a medium stack on my immediate left is like having the button twice an orbit. This is an ideal situation. In fact, this tendency even sometimes factors into my decision to call a shove from a tight short stack on my left. If I make a good call and lose, the player will double up to a medium stack, which in turn will cause the player to play even tighter and allow me to steal more going forward. Loose players tend not to tighten up with a medium stack. Some will play it more like a short stack and shove it in light with more big blinds that most players. Others will play it more like a big stack and three-bet light or make speculative calls with it. Neither of these situations is good for me if I am on a pure steal, so I will open a tighter, more playable range when these players have position on me. That way, I can call more often if they decide to shove or stack off more often postflop if they choose to flat me wide. The main thing I need to avoid in this situation is opening wide, getting it in with a marginal hand, and risking them winning to become a loose-aggressive big stack on my left. When one of the medium stacks on my left is in the big blind, a very profitable situation arises. Here, I will raise with a wide range of hands that play somewhat well postflop like medium offsuit one-gappers or suited two-gappers. I expect my opponent to call in the big blind often if he has too many chips to shove, but not enough to three-bet fold. This results in him having a wide, capped range out of position against my uncapped range in position. If I have a read that he plays marginal hands passively and nutted hands aggressively postflop, I can expect double- and triple-barrels to generate a ton of folds on boards where he flops just enough to call a continuation bet, but not enough to stack off with when I empty the clip. This article is about how stack sizes affect ranges, but position does as well. Generally, I want to avoid getting into too many pots with tight players who open from early position with medium stacks. They have stronger ranges that I won't be able to bluff them off of and I don't have the implied odds to play many speculative hands against them. That said, even tight players will open wider ranges from late position. This is the perfect time to bluff them. They may fold a hand like from early position but feel it is safe to open with it from the hijack or cut off. If I have position on them, I will three-bet them with something like and expect to win the pot preflop a ton because I can use a small percentage of my stack to leverage their entire stack, putting them to an existential decision. The same can be said for loose players, although the passive ones are more likely to call the three-bet with a hand like and let me win postflop with a continuation bet or double-barrel when we both miss. Meanwhile the aggressive ones may four-bet bluff hands like this and force me to fold. A great spot for a light three-bet against a loose player can turn into a losing play if I haven't observed the table enough to know how he will react to it. Next week, I will wrap up this series by discussing some of the adjustments I make when facing big stacks around the table. Finding a trustworthy room to play online poker can be a monumental burden. That's all the more true if you're just looking for a place to play poker for free. We've listed five of the best play-money poker sites to enjoy and help hone your skills.